Blessed Theresa of Jesus Gerhardinger, longing for the oneness of all in God, grounded the congregation in Eucharist, anchored it in poverty and dedicated it to Mary. Here are the answers to some frequently asked questions about School Sisters of Notre Dame. 1. 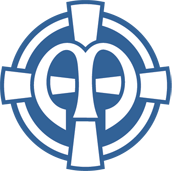 What does the SSND symbol (pictured below) represent? The SSND logo for Africa, Asia and North America is based on the symbol at left. The cross symbolizes Christ – the center of our lives. The circle – community and the world we serve. The M represents Mary, the mother of our congregation. This symbol, which many sisters wear as a pin or pendant, was designed exclusively for the School Sisters of Notre Dame and allows us to identify ourselves to each other and to those with whom we work and come into contact. 2. Why do some sisters wear a veil and others don’t? Some Sisters wear veils because traditionally, in the Church, this garb was the recognized form of clothing for a member of a religious community. These Sisters prefer to honor that tradition. Some Sisters don’t wear a veil because they have chosen a different outward sign/symbol of their religious lifestyle commitment: a special cross, a ring, a pin that represents their specific community. 3. What does the word “charism” mean? Charism is a gift of the Holy Spirit given to an individual for the good of others. We strive to follow the charism of our foundress, Blessed Mary Theresa Gerhardinger, who had a special commitment to women, children and persons who are poor. Some elements of the School Sisters of Notre Dame charism are unity, educating in all we do and world vision. The word is sometimes used as a synonym for mission. 4. Do sisters still live in convents? Some sisters do still live in convents. Others now choose to live in smaller communities or with members of other congregations. For those who dwell alone, there is the option of forming an extended faith community with other Sisters. 5. Are the School Sisters of Notre Dame associated with the University of Notre Dame in South Bend, Ind. ?